Looking for the best tabletop radio in 2019? These days there are so many different brands and models that make choosing the radio quite overwhelming. Radios designed for tabletop use have been around since the 1920s and have developed over the years to be much more than just simple radio receivers. Today you can expect modern radios to have many different features, including alarm functions, cd players, AUX outputs, Bluetooth receivers, and even internet connections. The range of radios currently available varies greatly. From low budget basic radios to extremely high-quality premium listening devices, there is a radio for everyone. To make your choice easier, we’ve done the hard work and have reviewed the top ten of the most popular tabletop radios on the market. The articles goes into a detailed analysis and highlights features, pros, cons and provides a quick summary if you are on the run. So, what are you waiting for? Read on to find out what make and model is the top tabletop radio available for you in 2019. The most complete an all-in-one speaker with AM/FM/DAB radio, CD player, Bluetooth, and WiFi. Best radio for your tabletop overall. Great sound, modern looks and access to over 30,000 radio stations over the internet. A best selling mid-range table-top internet radio on Amazon. High-fidelity sound coupled with one-touch streaming in a gorgeous hand-crafted wood cabinet. Access 20+ thousand internet stations and 30+ million songs over Spotify Connect. Mid-century design meets latest tech in audio development. Solid build quality, compact size, warm and room filling sound. A classic analog AM/FM radio housed in a real wood cabinet. It delivers a quality balanced sound and allows Bluetooth streaming from your phone. A unique two standalone speaker design for a true stereo experience. Powerful, bass enhanced sound beyond its size and Bluetooth streaming. Compact, tower design HD radio with FM band and Bluetooth streaming support. It can also charge your phone or tablet. Small, simple and extremely affordable tabletop internet radio with access to over 26,000 radio stations and Bluetooth streaming. One of the most acclaimed digital tabletop radios ever made. Next generation features, premium build, high fidelity sound with rich bass. Simple, elegant, classic looking AM/FM tabletop radio. Acoustically tuned wooden cabinet looks great and help to deliver richer sound. Classic analog controls give it a nice retro touch and close to perfect tactile feel. 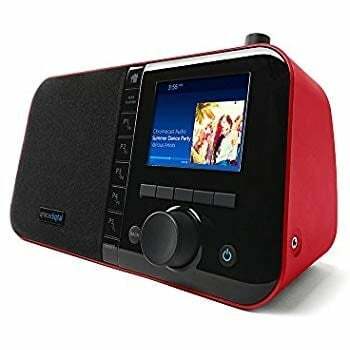 The most complete an all-in-one speaker with AM/FM/DAB radio, CD player, Bluetooth, and WiFi connection. 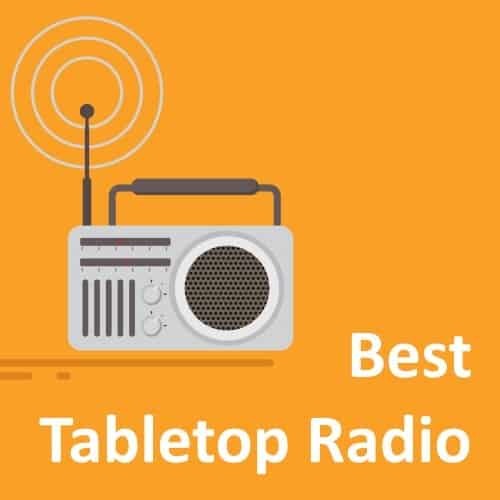 Best tabletop radio overall, hands down. Bose Wave SoundTouch is an all-in-one speaker with AM/FM/DAB radio, CD player, Bluetooth, and WiFi connection. Bose is renowned for beautiful designs and Wave SoundTouch continues this longstanding tradition. The radio has a sleek, modern design that would look good anywhere in your home. There are two parts to the unit, the actual speaker and the receiver. The speaker sits on top of the receiver, but they are not physically connected. One of the highlights of the device is the touch-screen LED panel. The information display on the panel is very clear and shows station details when in radio mode. If you are interested in using Bose Wave SoundTouch as a speaker for other media, you are in luck. With the built-in Bluetooth, you can easily pair your smartphone, tablet or computer to stream music, podcasts or any other type of audio. There is also the Wave SoundTouch app that enables you to connect the device to your home WiFi. The app lets you control music selections through apps such as Spotify and Amazon Music and also can access thousands of radio stations on the internet. We found that using the app is the easiest to control the radio. In addition, you can download Alexa app and have any Alexa-ready dice, such as Amazon Echo, to control your radio. Sometimes it can be hard to choose the most impressive feature, but the audio quality of this Bose radio stands out more than anything else. It produces a clean, rich, room-filling sound through the use of Bose Wave Guide Technology. Air gets pushed through the speakers in all different directions, which makes it sound like a big stereo system without the huge amplifier and speakers. Bose sound signature is known for being bass heavy, and this radio is no different. However, if you don’t like the big bass sound, it’s super easy to turn it down and find your preferences in the settings menu. While there aren’t many downsides to this radio it doesn’t come with an external aerial. You can still enjoy the radio without it, but if you are in an area that doesn’t have strong reception you might feel the need for it. Some of the wireless streaming features will also be limited if you don’t have a strong internet connection. Other than that, we’ve got the best radio for home you can buy today if you don’t mind spending some extra cash. 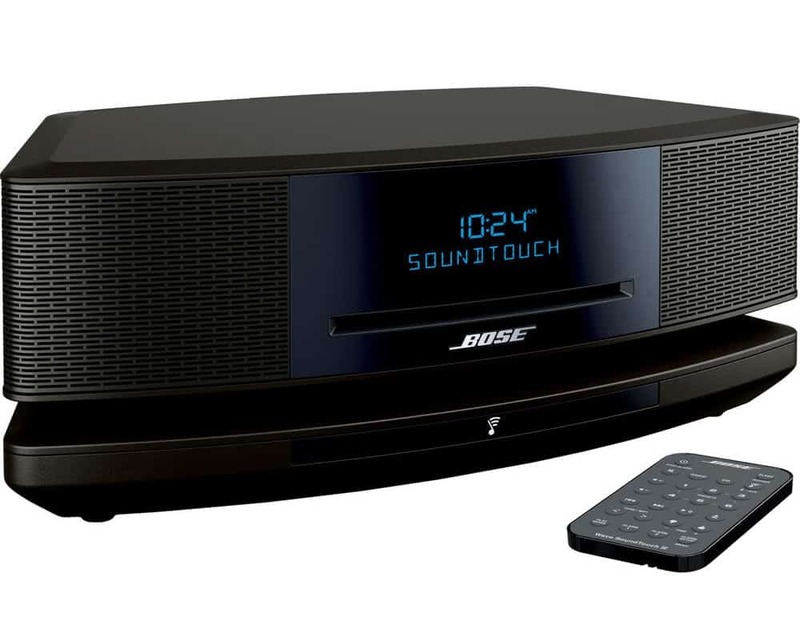 Bose Wave SoundTouch is one of the best sounding tabletop radios on the market. The combination of radio, streaming and CD player are unmatched and there aren’t many options on the market that would host all those features in a single device. Although it could be improved with an external radio antenna, it still is the best tabletop radio CD player we’ve seen in a while. 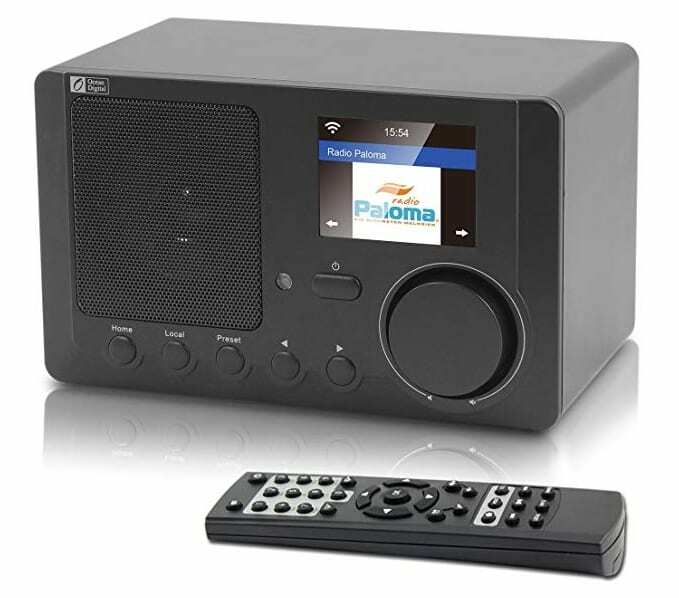 Grace Digital Mondo+ is a mid-price-point tabletop radio offering great value for your money. The device can be used in two different ways. The radio can play internet stations of alternatively be used as a speaker for the Bluetooth streaming from a portable device. The design is modern, functional, and its small size is perfect for a nightstand. The highlight feature, however, is the full-color 3.5″ LCD display. The screen allows for easy navigation through the menu and it displays time, artist and station info when it’s being used. It would be cool if it was also a touch screen, yet the current button operated design is functional nevertheless. The tabletop radio features a single mono speaker, but there are options to expand this if you have other Grace branded speakers using Google Chromecast. Some people might find that there are too many buttons on the face of Grace Digital Mondo+ but they don’t take up much space and don’t really feel out of place. There are plenty of connectivity options, with twin RCA and USB ports and an infrared remote. To be able to use the radio, all you need is access to the internet via a WiFi network. Once connected, you can stream thousands of radio channels from all over the world. The built-in Bluetooth connectivity makes the radio a speaker as you can use it to stream media from one of your portable devices. You can also connect it to Google Home Assistant or Amazon Alexa. Overall the audio experience is great, given a relatively small tabletop radio size. It has a 12 watt Class D amplifier, a 3″ woofer, and a basic 1″ tweeter that delivers a clear sound. There is no physical AM or FM receiver in the Grace Digital Mondo+, so streaming radio stations over the internet is the only way to go. Just make sure you have a decent internet connection. If you have decided to go with an radio over internet for your home, make sure you also check the best internet radio review we have just finished baking! Grace Digital Mondo+ has a great design and very respectable audio reproductiojn for a mid-range table-top radio. It has loads of features and would be a nice addition to a small desk or nightstand. Having no analog AM/FM receiver won’t be an issue for people with internet access, alternatively you may want to check other radios in our review. Como is a grassroots company that has a loyal following. 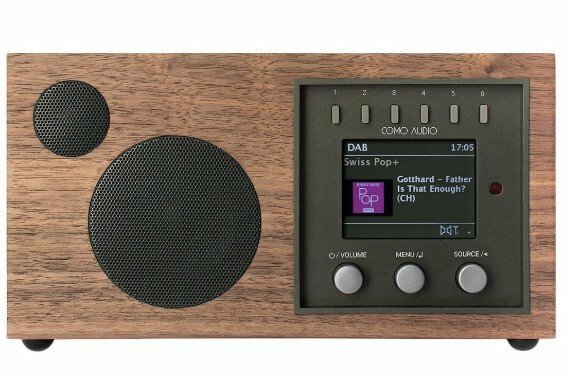 Como Audio Solo was made possible by those who have contributed to the Kickstarter campaign and funded the first production run with pre-orders and donations. As one of the users, I am truly grateful for such strong support, as this table-top radio is simply awesome. As you can probably tell, the design and usability have been given a priority to make one of the best looking table-top radios you can buy. The device features a beautiful real wood veneer finish. The display screen on Como Audio Solo is clear, bright and comes with a few handy features. When in use, the screen will show you album artwork or station logo that you are listening to, and you can also adjust the backlight to control the brightness of the screen. There are a few different ways to control the radio. You can use the controls at the front, a remote that’s included in the packaging or the Como smartphone app. The app is usually the most preferred way to control the radio, but the other two options also work as designed. Apart from the typical AUX and Bluetooth connections the radio also features an optical input which is more often seen in soundbars and home entertainment systems. On top of being able to stream radio over the internet, the radio has an analog FM receiver with a telescopic external FM antenna. It gives an extra layer of functionality since it can be used as analog radio and won’t need an Internet connection to work. The sound produced by Como Audio Solo is more than decent. The radio features a ¾” tweeter and 3” woofer with an oversized magnet housed in different sections to improve the low-end performance. Overall, the tonal balance is good with a good level of bass that doesn’t overpower the mix. At the same time, you don’t want to push this tabletop radio to its limits as it starts to get slightly harsh at maximum volume and a lot less enjoyable. 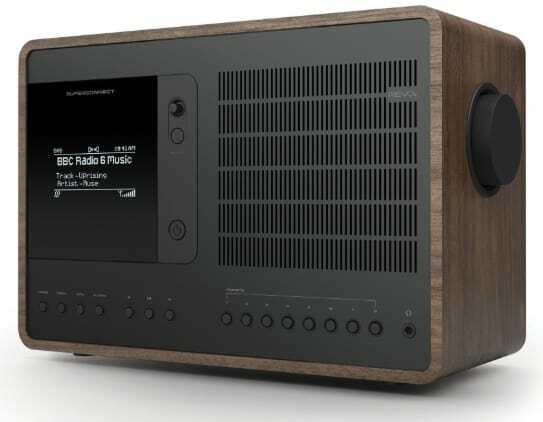 Como Audio Solo is a gorgeous looking and sounding table-top radio that features one-touch audio streaming and surprisingly clear and balanced Hi-Fi sound. It has a good range of features including optical audio input and represents an incredible value-for-money. It does not hold high volume well, resulting in a moderate sound distortion, but if you don’t need it to be loud, it is a treat to listen and use. Crosley Solo is an old-school table-top radio suited for budget buyers. It has one of the lowest price-points on this list, but it still can offer you a decent unit despite the low price. A big highlight of Crosley Solo is the retro style design. It resembles a 1960s radio and continues Crosley’s dedication to classic Americana designs. It is a fantastic homage to yesteryear and it really looks like no other radio on the market. Our favorite design quirk is the art deco style tuning dial. It’s just so cool! The radio is simple, in fact as simple as it gets. You get an analog tuning dial and two LED lights: one that turns green when the power is turned on and another that turns yellow when you tune into a station. Also, you will find a headphone jack and AUX input, and that is about it. The location of the speaker on Crosley Solo is somewhat odd as it’s at the top of the unit facing up. This means that the sound travels upwards, rather than frontwards like with the majority of radios. Although it still works fine as a tabletop radio, it works even better when it sits on the floor or a stand-up desk. Audio performance is not the highlight of Crosley Solo and given the price point, you should not expect it to be. In general, it sounds fine the treble can be a little hissy at times. On the downside, we would love to see things like preset functions, auto scan and perhaps DAB compatibility. It would make this neat little unit even more awesome. 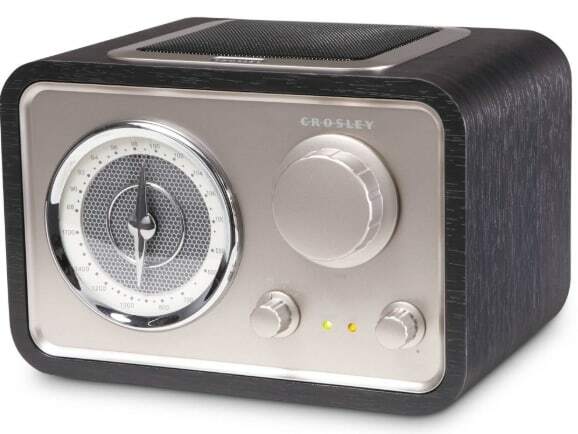 Crosley Solo is a suburb retro looking table-top radio. For the penny pinches who want a cool looking radio, this is a great option to consider. The radio delivers a good sound quality but it won’t blow you away. However, the simplicity, visual appeal and the affordable price tag should. if you are after the most basic, retro looking device that only supports analog bands, Crosley Solo is the best tabletop AM FM radio in our list. Looking for a table top wooden radio with a simple design yet with some of the latest tech? If so, Tivoli Audio Model One is worth having a good look at. The radio is well made as it is housed in a furniture-grade wooden cabinet. It gives the radio a very classy look which would fit any desk, side table or countertop. The radio is quite simple to use as there are only three knobs: volume, feature select, and tuner. The controls feel sturdy and smooth at the same which feels good in the hand when using them. A nice added extra is the two LED lights. One is a power indicator and the other helps you to determine the signal strength of the station. It turns yellow when the station is tuned in and has a reliable and consistent signal. The tuning accuracy is quite impressive for a non-digital radio. The included antenna at the back of the radio can be extended to further improve reception strength. Even though Model One has only one mono speaker the sound is rich and resonant. The radio isn’t made to be turned up extremely loud and has sufficient clarity and richness on moderate volume levels. When you do turn it up, it does hold music without distortions yet the tonal balance changes. On the downside, the radio does not feature a WiFi connection which means no Wi-Fi or internet streaming capabilities. At the same time, it does feature a Bluetooth and an AUX port allowing you to connect your portable devices by pairing or using a 3.5mm cable. Lastly, a built-in alarm clock would have been a handy addition. If you are after a simple AM FM radio that is well made and features Bluetooth capabilities Tivoli Audio Model One is a great choice. The sound delivery is decent for the small radio size and a single mono speaker. Also, the AM / FM signal strength is amazing, making it a perfect tabletop radio with best reception in our review. Sangean WR-50P FM-RBDS features an innovative design approach for indoor radios. Unlike other stereo stationary radios in our list that host both speakers in the same body, Sangean WR-50P has separated two speakers into individual cases. One case has only a speaker inside and the other has a speaker, the radio itself and the controls. Both of the speakers are the same size and they look great on a table together. If, however, you are struggling to find space for two speakers, Sangean WR-50P can also work with a single speaker delivering quality mono sound. The color choice contributes greatly to the overall design appeal. The two-tone color design has a dark black casing and a lighter grey on front and back panels. The vertical design of the radio also separates it from a lot of its contemporaries. Instead of having a low profile like a lot of traditional radios, it looks more like a mini Hi-Fi tower that was popular in the early 2000s. The rich and powerful sound the radio delivers is truly awesome, particularly due to its stereo capabilities. Music and vocals are reproduced clearly and the frequency range comes out balanced. Sangean WR-50P comes with a very functional remote that is a huge plus. The remote has dedicated bass, loudness and treble controls which is not often seen, even in the most expensive tabletop radios out there. The radio reception is stellar thanks to the DSP technology it is using. In case you ever want to stream music or podcast from one of your portable devices to the tabletop radio, Bluetooth pairing can be used. In addition, Sangean WR-50P could be your bedtime companion as it comes with an alarm timer and a buzzer. Lastly, we could not find any reasonable downsides to Sangean WR-50P FM-RBDS. For a relatively low price, you are getting a quality tabletop radio with unique design and considerably above average sound. Sangean WR-50P is one of the best value table-top radios in our review despite its mid-price-point. It has a great AM/FM reception, amazing sound and unique looks. The unique design to keep two speakers separated allows you to have a wider, room-filling stereo sound. In fact, one of the best sounds for a compact size table-top radio we’ve seen. Sparc SHD-BT1 is a digital tabletop radio that uses an HD Radio technology. It differs from traditional radio as it gives you a crystal clear radio reception and does not require internet access. HD Radios are typically found in new cars these days and aren’t yet common in tabletop radios. The trend is picking up however and we should see more models entering the market. For the moment, if you want a premium audio quality, signal strength but do not have a strong internet connection at home to justify the radio that work over the internet – Sparc SHD-BT1 is a top HD Radio option to consider. The radio has a very simple design that makes it easy to set up and use. It has a smaller footprint than comparable Sangean and Tivoli models so it would be a great as a bedside table radio. The dark woodgrain finish around the border is a nice touch and gives the radio a nice warm look to it. There are loads of features in Sparc SHD-BT1. Equipped with dual alarms and sleep timer, you can use this radio as an alarm clock, but the sleep feature can only be used when the radio is turned on. It has plenty of presets – 20 in total, and an AUX out jack for you to plug in a media device. A neat feature is the built-in five volt USB port on the back that you can use charge your smartphone. Bluetooth connectivity is also a welcome inclusion that expands the radio’s use into a Bluetooth speaker. The lack of a headphone jack is a small disappointment, but if you don’t plan to use headphones with this radio, it would not be a concern. Even though Sparc SHD-BT1 has just one mono speaker, it delivers a clear and crisp sound that holds up well at high volumes. 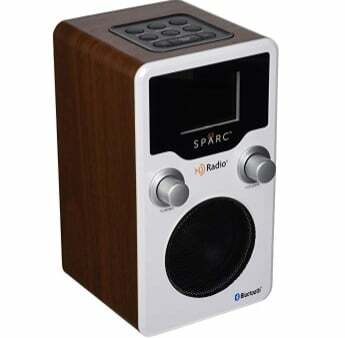 Sparc SHD-BT1 is an excellent value HD radio that is perfect for a bedside table or desk use due to its small size. The sound quality is decent for the size despite it being powered by a single mono speaker. If you need an HD Radio and Bluetooth streaming capabilities in a small and compact size, Sparc SHD-BT1 is the best tabletop HD radio we’ve tested. Ocean Digital WR-210CB is online radio only device that is simple to use, affordable to buy and is small in size. The radio has a great build quality with many features being packed in a small design. Some of which, are typically found in stationary radios that are double the price. Amongst the basic features, there is an AUX out, Bluetooth connectivity and two alarms. The date and time get automatically updated through the satellite connectivity. Access to thousands of radio stations over the internet is the main feature of Ocean Digital WR-210CB and it is incorporated into the device in a very nice way. Through the menu, you can search for different regions or genre to easily choose a station to listen to. A great inclusion is the “radio history” menu that tells you what stations you have previously listened to. It has 250 preset slots and can pick up over 26,000 radio stations available on the internet. When selecting a station, it could buffer before starting. If you have a strong WiFi connection, this buffering won’t take long, but it may be an issue with slower connections. The radio scroll wheel is quite easy to use, but inserting your WiFi password with the scroll wheel when you first set up the radio is a little tricky. Using the remote that comes with the radio is a lot better than the on-radio controls. Scrolling through all the different menus and stations is much easier on the remote than with the scroll wheel. Ocean Digital WR-210CB doesn’t have an antenna or other radio options as it supports radio over WiFi only. In essence, as long as you have a stable internet connection, you should always have access to your favorite radio stations from around the world. The audio quality is decent on Ocean Digital WR-210CB but nothing spectacular. If you are used to a more audiophile-grade radio, the difference would be noticeable. It has a small speaker, and if you use it as your primary speaker it might be disappointing, but if you are a casual listener, it will be great for your needs. Ocean Digital WR-210CB is a great little online radio for a casual listener. It is perfect for your bedside use as an alarm clock or radio due to its simplicity and size. The audio quality is just ok with no real highlights or things to complain about. This radio was designed to be compact, easy to use and is more tailored as a background radio listening experience and it does a brilliant job at it. If you are on the market for the premium tabletop radio, Revo SuperConnect is not to be missed. It features a cool-looking design that combines some elements from the 60s, 70s and modern days. The cabinet housing is made of American walnut wood and clad. The front of the radio is made of aluminum, which coupled with real wood housing looks absolutely stunning. To complement the premium design, the front of the radio features a graphical OLED display that dims when the screen isn’t in use. All buttons are positioned in a retro-style at the bottom of the radio with the headphone jack nicely blending in between them. Revo SuperConnect is packed full of advanced features and supports all radio types (except AM band) you can imagine. It comes with a the Internet/WiFI radio, DAB and a standard FM tuner. Other connectivity options include Bluetooth with aptX. The technology delivers CD-quality wireless streaming from mobile phones, tablets, and other portable devices. Besides, the radio can be paired with Spotify Connect which allows the Spotify app to be used as a remote control for the radio. In terms of sound, Revo SuperConnect is one of the best sounding tabletop radios ever to hit our hands. It is very comparable with Bose Wave SoundTouch we’ve reviewed earlier. It is not as powerful as what Bose can produce, but it is definitely on par concerning clarity, balance and the overall audio fidelity. The radio uses the Balanced Mode Radiator (BMR) technology, which helps to improve the overall sound by combing a full-range sound without having to separate treble and mid-range. There are 15 watts of power pushing clear digital audio with amazing clarity and deep, rich bass. One of the only complaints we have with Revo SuperConnect is the WiFi signal strength. It seems to do an average job compared to other WiFi radios on the market, so you may want to keep your radio not too far away from your WiFi router. Well, apart from the only other hiccup that deletes user settings after completing the firmware update. Revo SuperConnect is a modern classic in a premium tabletop radio segment. With incredible attention to details, it does feel that it was carefully crafted to be technologically advanced, functionally sound and visually stunning. It delivers a full scale, rich and bright sound full of authority and depth. If you can stretch your wallet just enough, Revo SuperConnect will reward you with the most high-end tabletop radio experience out there. 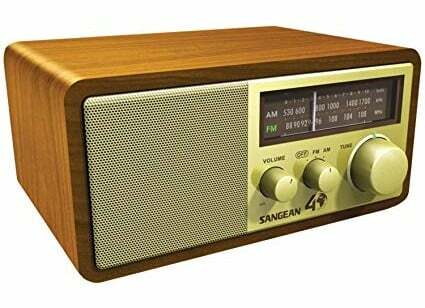 Sangean WR-11SE is a retro-style tabletop radio that was developed with the retro purists in mind. The unit is housed in a quality MDF casing with a real walnut veneer finish. The device is very simple to use with just three knobs: volume, bandwidth, and tuning. The tuning dial and the bandwidth indicator glows in the dark, which is a cool inclusion that combines modern technology with the retro look. Once you tune in to a station with the optimal signal strength, the light turns on. At the back of Sangean WR-11SE, you will find plenty of connection options, such as AUX in, recording out, headphone jack and a connection for the external antenna. The sound is powered by 3″ full range driver that delivers a very respectable audio quality. Despite being mono, It gets loud enough to fill a medium size room with plenty of AM / FM sound. Regarding the tonal balance, the radio favors lower frequencies, hence the bass feels a little bit more pronounced than vocals or treble. This is quite surprising as most receivers in the same size and price range seem to emphasize mids more than other frequencies. 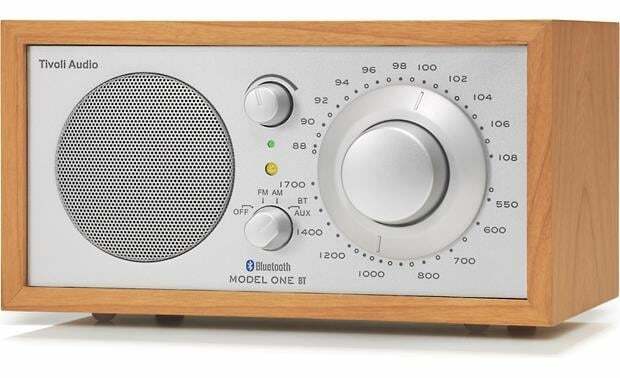 Overall, it works well for both music and podcast type stations, but if you are looking for a flat, old-school radio experience, this may come out slightly too bright for you. Unfortunately, there is no battery department for this radio. This limits the portability, so you have to be close to the AC plug to be able to use it. For a pure tabletop radio, this may carry little weight, but if you are looking for something more portable feel free to check our top portable radio review. Sangean WR-11SE is a great looking and small tabletop radio with AM / FM band only. It features a mono 3″ speaker housed in a real walnut veneer finish that sounds surprisingly loud for its size. Build quality is great and the tactile feel for tuning and volume controls feels premium. If you are looking for a simple AM/FM analog tabletop radio that is beautifully executed and sounds great, Sangean WR-11SE is worth your consideration. All table-top radios on our list are great products that fit a variety of different needs. Whether you are looking for a budget, high end or something in between, there is a table-top radio out there for you. For the budget conscious the Crosley Solo, Sangean WR-11SE, Sparc SHD-BT1 or Ocean Digital Internet Radio are great choices that will do the basic jobs needed of a table-top radio. Got a bit more money to spend or need a little more features? There are some really great value-for-money radios between $100 and $200. 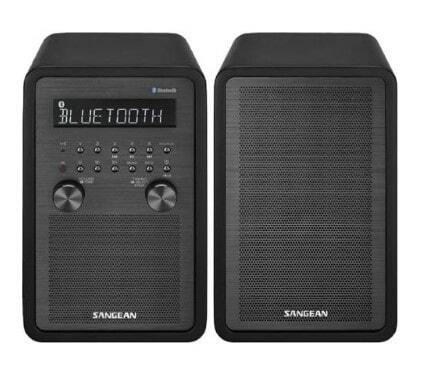 Our favorites in this price range are Sangean WR-50P FM-RBDS for stereo sound and added connectivity, making it one of the best radio with Bluetooth capabilities. Alternatively, Tivoli Audio Model One AM/FM Table Radio and Grace Digital Mondo+ are great if you need a smaller radio. The latter one, however, focuses heavily on internet radio streaming. For the premium end of the market, the prices really vary. Como Audio Solo and Revo SuperConnect are comparable, but the latter has a better sound fidelity and is comes out more refined. At the top of premium radio range you will find Bose Wave SoundTouch. It costs north of $500, but if you want one of the best tabletop radios ever made, this is probably it. There are three main distinct types of radios you need to be aware of before you start reading any tabletop radio reviews. Some models manage to combine them in one device. An ability to listen to radio stations over the internet is the latest trend that is rapidly expanding. The technology uses the Internet to broadcast radio stations instead of traditional radio waves. By using the internet and not traditional waves you have thousands of more listening options and a global reach. Have a favorite radio station from when you were a kid? Chances are they stream it online, and if they do you can listen to it with any internet radio. You can listen to internet (or also known as WiFi radio) from a computer, but including it in a table-top radio is a popular choice by manufacturers. If you live in an area that has poor internet you will have trouble streaming the stations. You will encounter buffering issues that will interrupt the broadcast, so it won’t be a useful feature for you. Some new radios, such as the Ocean Digital Internet Radio can only access radio stations over the internet, so make sure you have a good internet connection before going with that option. Remember analog TV? Well, digital radio is the equivalent to digital television. The technology works by turning sound waves into digital signals for transmission. These signals are then decoded using digital radio receivers so that you can listen to them. The result is a very high-quality sound that is almost CD quality. Older analog radios can’t pick up digital radio so only new devices that are compatible (DAB) can listen in. Digital radios are great if you want to listen to radio with a better quality audio, or if you want to prevent your device from becoming obsolete if standard AM/FM broadcasts get shut down in the future. Despite the two newer and higher quality ways to listen to the radio, the classic analog radio is still popular. Why you may wonder? Well, analog radio is still the cheapest to make and is still used by millions of people around the world. 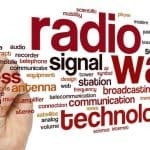 Both internet and digital radio are still emerging technologies that will eventually take over from the classic analog broadcast but for now, it’s still readily available. For newer radios it isn’t as common for them to come with analog radio antennas, but some still do. Why buy a tabletop radio? There are many reasons to buy a tabletop radio. They have a variety of uses and come with different functions that can help make you more comfortable in your home. The obvious answer is tune into and listen to your favorite station at home through a decent speaker. You can use radio to stay connected to the world through news and current event channels, or discover new music and relive old favorites on music channels. Tabletop radios are also popular as bedside devices. You can use them to set your morning alarm, listen to them before bed or when you wake up to start your day. A lot of tabletop radios also make use of their speakers in multiple ways. Most will have a way for you to listen to other media devices. This could be through an AUX input, USB connection or Bluetooth. Bluetooth is the most popular way to connect your phone or another device to tabletop radios. Once you pair your device with a radio you can wirelessly stream your audio to the speaker. Being able to do this really gives table-top radios that have Bluetooth another dimension to their use. Sound quality differs greatly between tabletop radios in our review. Typically, the more affordable the radio is, the less impressive audio characteristics it comes with. The radios will be fine if you don’t need amazing sound quality, but for those who love radio and music, you should consider a unit that has either stereo sound or more advanced mono technology. A standard mono device has only a single speaker which makes it a mono channel setup. Conversely, radios with stereo speakers or advanced mono technology have two channels for clearer and better audio reproduction. Another thing to consider is the material the radio case is made of. Most of the time, it is either plastic or MDF. Budget radios typically use plastic as it is easier and cheaper to manufacture yet it is not the best choice if you want to push for a better sound. MDF radio cases tend to create a more natural soundstage and soften out of place frequency sounds. 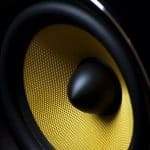 The tip is – if you can, always go for MDF casing as the radio would deliver deeper and more powerful bass. In addition, it simply feels more pleasant and natural to listen to. The look of a table-top radio is a secondary but still an important thing to consider before purchase. Since most of radios are expected to be placed in lounges and bedrooms, the visual appeal may be critical if you want it to blend nicely with your overall design. Some of the vintage radio purists may prefer a retro look, which there are now a couple of options to choose from. You will find tabletop radios in all different designs. It is up to your personal choice as to what you prefer, but in nutshell, they range from retro-themed, futuristic, modern or a mix of wood with modern touches. Depending on your intended use, your connectivity needs may also vary. 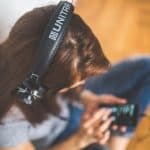 In general, there are three main connection points you want to consider – physical headphone jack, WiFi and Bluetooth. The headphone jack allows you to use your headset without troubling other people around you. If you are looking for a bedside radio, then this may be a feature you need. Alternatively, if you plan to keep your radio stationary on the table – there could be very little need for a physical connection. In addition, the audio world is shifting away from cords and physical connections, so it maybe wise to consider a wireless pair of headphones instead. In terms of Bluetooth connectivity – it could be a very handy feature for many of us, especially knowing that most of us have some sort of a streaming app on their phone, be it Spotify, YouTube Music or Apple Music. If your tabletop radio support Bluetooth, you can use it a loudspeaker to play music from your portable device. Lastly, WiFi connection ensures that your radio always has access to the internet, which can be used to update your radio firmware to the latest version or stream music from one of the internet radio or music services such as TuneIn and many others. Radios are like everything you find in the tech shop – they can range anywhere from $20 to a couple of hundred dollars for a premium tabletop radio. Most of the price difference is justified by having a broader set of features, so if you want to stay cost wise, make sure you only pay for the features you are planning to use. Thinking about what features you would use will really help you decide what tabletop radio is best for you. Once you work out what you need you can narrow down the list and make a thoughtful choice. The less money usually means the fewer features. With radios at the cheaper end of the market they may not have Bluetooth and WiFi connectivity, but if you just want to use it to listen to the radio then they could be an option for you. If you want more features such as the ability to connect to other speakers in your house then check out the more expensive radios. The energy of the electromagnetic radiation is dependent on the frequency of its waves. If you increase the oscillation frequency by shortening the wavelengths it increases the amount of energy that the wave can carry. At the same time, radio waves are technically radiation which can be divided into two parts. The are ionizing and non-ionizing, which radio waves represent. There is no evidence that radio waves are harmful to humans, hence are considered safe. The radio was invented by Guglielmo Marconi: an Italian who has proved that radio is a feasible option to broadcast audio signal. The first radio signal was received in 1895. 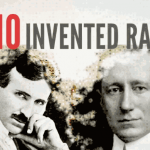 Four years later, Guglielmo Marconi sent the first wireless signal across the English Channel. He has since, received the letter “S”, telegraphed from England to Newfoundland.